My Southern family’s favorite foods during my childhood were fresh, homegrown vegetables, sprinkled with only salt and pepper. The household’s spice cabinet usually held only a few standard spices like cinnamon, ginger, cloves, garlic powder, chili powder, and condiments required for pickling. The nation’s and my family’s selection of spices increased and became more exotic in the 1980’s. By then an upsurge in new restaurants had introduced dishes from Asian, European, Mediterranean and Middle Eastern countries. During that decade, the annual spice consumption of average Americans rose from one to two pounds. Accordingly, the growing of herbs and spices has taken off as one of the fastest developing American agricultural industries, producing about 200 billion pounds per year. My own cooking significantly reflects this increased herbal popularity. Spice jars overflow from kitchen drawers to a counter-top spice rack. Packages of fresh herbs often reside in the refrigerator. An obsession with quirky recipes has contributed to this myriad of herbs and spices. 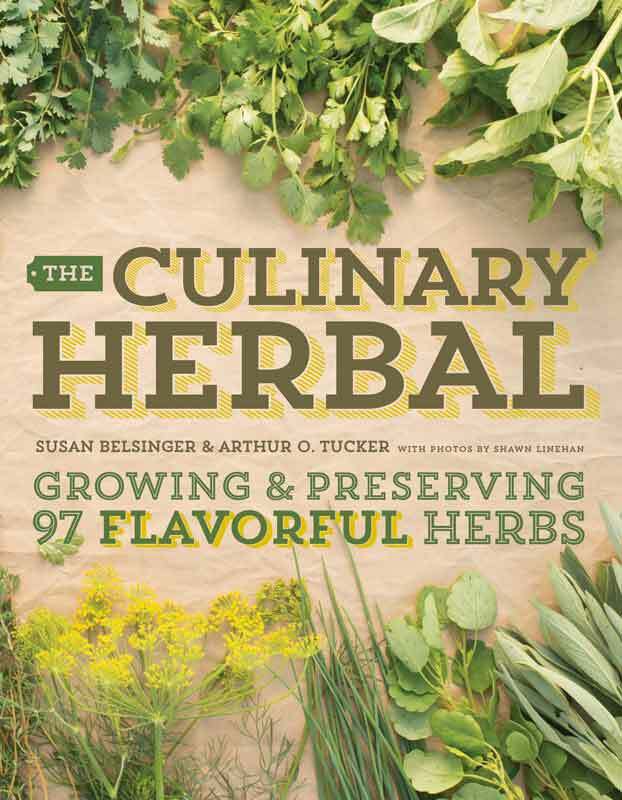 Fortunately, for me and other cooks and gardeners, The Culinary Herbal (Timber Press, 2016) by Susan Belsinger and Arthur O. Tucker provides the necessary information to correctly use, grow and preserve 97 herbs. This book presents the herbs in alphabetical order by common name with scientific names and photographs accompanying them. Instead of dealing with the medical attributes of herbs, the authors emphasize the taste and smells of the plants. Whether these qualities of a plant are best used as fresh or cooked and how to prepare it are explained. The actual taste and aroma of each is described much as flavors of wine are described at a tasting party. For somewhat conservative cooks, non-tropically grown herbs and spices that appear in ordinary grocery stores are discussed. Especially interesting to me was learning about those herbs that seem to appear as a fresh ingredient in many contemporary recipes, such as cilantro, fennel or dill. For example, the authors recommend planting several cilantro types that overcome this herb’s tendency to quickly bolt in hot weather. For adventurous cooks and gardeners, the use of flowers such as roses, violas, daylily, and hibiscus to beautify and flavor dishes is discussed. The most unusual suggestions for herbal flavor are chickweed, stinging nettle, and sow thistle, which are best known as common weeds. After introducing the individual culinary plants, the final sections offer tips on harvesting, drying and freezing to best preserve the herbs’ tastes and smells. The book ends with recipes and instructions for preparing herbal syrups, vinegars, pastes, and butters. With the season here for selecting seeds and plants for this year’s garden, choose some familiar herbs to enjoy their fresh, delicious tastes. Oregano, basil and thyme are unbeatable. Then add a new herb, maybe one you tasted in an exotic dish, to enjoy as a new garden plant and as a new flavor in your kitchen.